Lessons Learned from Marie Kondo's "Tidying Up"
Have you tuned in yet to the new Netflix show, “Tidying Up” with Marie Kondo? It seems everyone has been watching the series, so I had to watch also. The show is based on Marie’s best-selling book, The Life Changing Magic of Tidying Up. Marie, a self-proclaimed “tidying expert” prescribes a very specific process to clear your space. If you follow the KonMarie process, Marie asserts your clutter will be gone forever. Make time to organize. The clients on “Tidying Up” were successful in their organizing projects partly because they set aside the time to declutter and organize. For some of them it took many weeks and months. While I’m not suggesting you quit your job and just work on getting organized, setting aside consistent blocks of time will help you reach your organizing goals faster. Be clear on your motivation. The clients on the show each had their own reasons to get organized. From merging households, to moving or downsizing, Marie helped the families bring forth their motivation for getting organized. This is another important component for success at organization—keep in mind why you want to get organized. Is your stuff holding you back from bigger and better things? Trust your decisions. I work a lot with clients to help them make decisions and trust in those decisions. “Tidying Up” showed that while decision making can be challenging, once you get going, it often gets easier. You can build momentum, starting with small decisions and working up to the harder ones. And once you decide to let something go, take the steps to get it out of your house and move it on. Have you watched the show? Has it inspired you to get organized? This summer my family went on a spectacular cruise to Alaska! For this trip we were downloading several different apps to our smartphones. My husband had the smart idea to organize them all into a single folder on his iPhone. He included our airline, rental car company, Airbnb, and a special app just for use on the Disney cruise, among others. Having the key apps in one folder on the front page of his phone made it so easy to find what we needed right away. 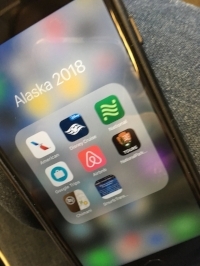 While I still recommend bringing printed copies of your travel confirmations and information, having hotel, air, and car company apps on your phone can be a lifesaver in case of travel delays or cancellations. Older TVs and computer monitors can be heavy and bulky, and because they have cathode ray tubes, or CRTs, with toxic chemicals they can’t just go out with your trash. This means they end up in the corners of our homes gathering dust. I find often find them tucked under a chair or table in the family room, the office, or even the basement. So how do you get these out of your house? If you are getting a new TV delivered, many companies (like Best Buy) will remove and recycle the old one for you. If you can’t take advantage of a take-away service, then check with your town to see if they offer a CRT recycling program. In my town you can bring your TV or monitor to the Department of Public Works and for a small fee, they will dispose of it for you. For a larger fee, the DPW will pick up the TV curbside in front of our homes, a few times a year. Want to donate your old TV (especially if it still works) or computer monitor? The Salvation Army also accepts electronics/appliances, including TVs and computers, and many Goodwill locations are now taking computers. You’ve got no excuses now to get your TVs and old computer monitors out of your house. Fascinated by the hoarding shows on TV? I was, and that's why I volunteered last summer to help out when the TLC show, "Hoarding: Buried Alive" came to Boston. Tune in to TLC on March 13th at 9pm and you might get a glimpse of me as part of the supporting crew of local organizers working to clean out the home. It was quite an experience, and I can’t wait to see how the episode turns out.